Gap’s New Celebrity Ads Tell Us to ‘Dress Normal.’ What Does That Mean, Exactly? 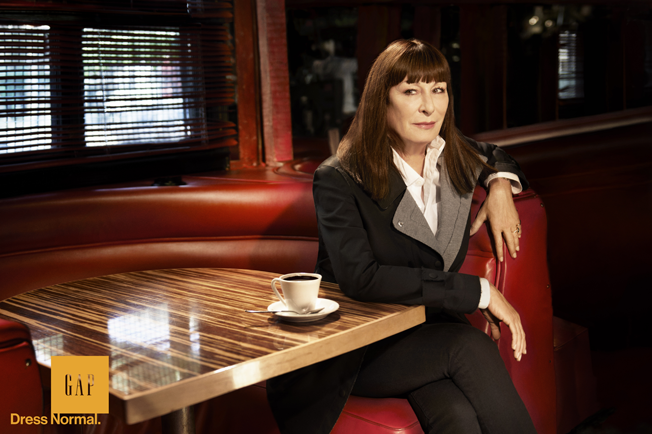 See this Gap ad with Anjelica Huston? How would you describe her look? Stylish? Sophisticated? Exceptional? Not according to Gap, which, as you can see, chooses a more unlikely word: Normal. "Finding your own version of 'Dress normal' is an art," Seth Farbman, Gap's global chief marketing officer, says of the brand's fall campaign from Wieden + Kennedy New York. "My normal is different from your normal, and that's the essence of the campaign." That's right, Gap is redefining the concept of normal from that of a collective norm to an individual belief. In other words, it now believes in normal relativism. I can only imagine the undergraduate philosophy courses they had to take before one of the creatives looked up and said, "There is no true normal. Normal is whatever's normal for you." And somebody replied, "Dude, mind blown. "If you didn't read the nice press release and just looked at the ads, you might say to yourself, "Wait, is Gap saying if I dress in other brands' clothing, I'm going to look like a freak?" Well, yeah, they kind of are. Look at how normal and everyday these famous celebrities look in our clothes. They're just so down to earth and self-possessed. Driving out to the desert to watch planes take off just like ordinary people. Don't you want to be normal? From the press release: "The campaign is rooted in the same core values the brand has unapologetically stood for over the past 45 years—individualism and the liberation that comes from confidently being your most authentic self." So, apparently, normal now means liberating and individual. I think they're trying to say something even subtler: that selecting a wardrobe should bring you closer to an understanding of yourself. That when you pick out what you want to wear, you're not just showing the world who you are, you're crafting your own personal narrative that reassures and centers your notion of self—the normal you. And somehow, through buying shirts at Gap, you'll eventually achieve self-actualization. Again, the press release explains: " 'Dress Normal' boldly instructs individuals to shape their own authentic, personal style—and intentionally challenges every one of us to dress for ourselves." By doing the exact opposite. That's deep. Let's stare at these seagulls for a while and think about it.